Living on campus opens a world of interaction with other students, faculty, and staff members in many social, developmental and academic activities. It’s a special time of learning and maturing, a time to be a member of the University family. 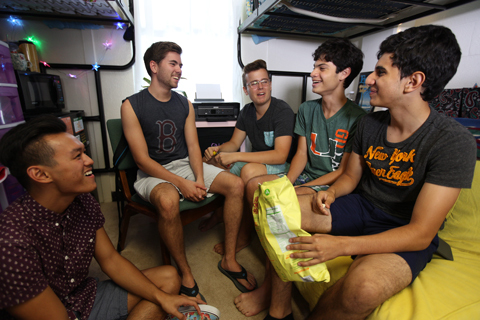 The University of Miami offers undergraduate on-campus housing in five residential colleges and University Village, which is comprised of seven apartment buildings. Housing is guaranteed to incoming first-year students provided they meet all deadlines. All non-local freshmen are required to live on campus. Local freshmen who plan to live off campus, must complete the Live-On Requirement Exemption form at miami.edu/housingexemption. First-year students admitted for the spring semester can apply for housing using the spring-only housing application available in CaneLink beginning in late October. Spring housing applications are due December 1. Housing applications received after that date are accepted on a space-available basis. Housing is offered for transfer students, but it depends upon capacity. We encourage you to stay on the housing waitlist, but to also explore living off campus. Review our Off-Campus Guide for information on what to look for when living off-campus and search off-campus listings. Admitted transfer students for the spring semester can access the “Housing Application Process” on their Student Home page in CaneLink beginning in late October. Housing applications are accepted on a space-available basis. For more information, visit miami.edu/housing. Admitted transfer students for the fall semester must access the “Housing Application Process” on their Student Home page in CaneLink prior to May 1 to receive priority placement on the housing waitlist. For more information, visit miami.edu/housing. Applying early will determine in part a student's future priority to access single rooms, be considered for room changes, and have earlier room selection appointment times. For more information, visit Applying for Housing. For complete information, including all meal plan rates, dining hall locations, hours, menus, and nutrition information, visit the Dining Services website at miami.edu/dining. To sign up in CaneLink, find Dining Services and select Add Block Meals. An email to Dining Services will be generated. Please include your name, student number, and your meal plan choice.